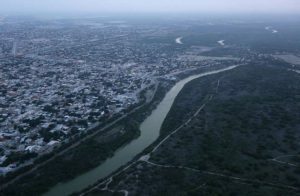 A Texas State Trooper was injured on the Texas-Mexico border, when he was hit by a bullet from a gun battle that happened on the Mexican side of the Rio Grande. Lt. Johnny Hernandez of the Texas Department of Safety confirmed that the state trooper did suffer a leg injury. This happened at about 1 p.m. Friday. The trooper was on foot patrol when it happened. He was accompanied by a border patrol agent at the time. It was confirmed that the border patrol agent was also hit, but was protected since he had body armor on. The trooper’s identity has not been released. He is at the McAllen Hospital and his condition is stable. There is not yet any information on who was involved in the gun battle that happened just across the border.